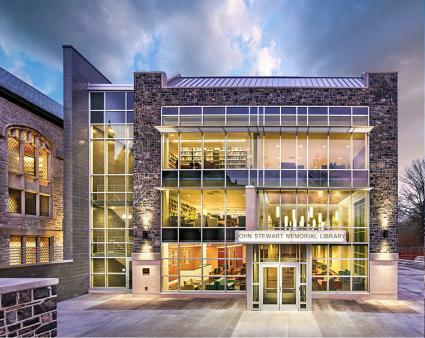 The John Stewart Memorial Library has become the heart of Wilson College by offering not only space for quiet learning and research, but a modern learning commons complete with areas for campus gatherings and services. The historic John Stewart Memorial Library originally opened in 1925 and was later restored and expanded, reopening in spring 2016. The library complements Wilson College’s academic program, providing both a place for quiet study and research and a hub for campus activity in the Lenfest Learning Commons. The learning commons provides a center for teaching and learning support, information technology services, tutoring and group study space alongside flexible areas for more casual gatherings. The bright and inviting space also houses the Cooley Gallery, a commuter lounge, a walk-up café and the College store. Visit the John Stewart Memorial Library website. Each student is assigned a personal librarian for the duration of your time at Wilson College. • Your personal librarian is happy to help you with any research project you are assigned, or even something of personal interest. • Personal librarians provide a range of assistance, from helping develop a research plan to identifying specific research resources. • We recommend checking in with your personal librarian at the start of every project, even if you think you have it under control yourself. Contact James D’Annibale, technology and instructional design librarian, with questions about this program. Our technology and instructional design librarian can help you learn new technologies or web tools. He has extensive experience with many instructional technologies and is always willing to learn something new to help students. Lenfest Learning Commons spaces are meant to promote collaboration among students within a welcoming environment. The commons has comfortable furniture and plenty of tables for group work or individual study. Study rooms with PC-connected flat-screens allow active groups a separate space to interact. The learning commons also features two computer labs. The Lenfest Learning Commons is also home to the Library & IT Helpdesk. Please contact the helpdesk for any computer or network-related issues. We provide access to databases with hundreds of thousands of articles, e-books, videos, etc. We also have OneSearch, which searches many of our databases at the same time. The reference and instruction librarian coordinates the Information Literacy Program. This program helps ensure that all students have the skills to work on research projects and to be able to find useful information. Information literacy instruction is included in many of your classes. All librarians work to ensure that you have access to all the information you need to be successful. If Wilson does not have what you need, we can acquire it either through an interlibrary loan or, if appropriate, by purchasing it for the Wilson collection.